Many coaches struggle with [tag]shooting drills for basketball[/tag]. Here is one suggestion that Jeff sent to me and has been successful. This [tag]basketball[/tag] [tag]drill[/tag] works best with 10 players but can be modified for more or less. Set up 2 teams – one offense, one defense. 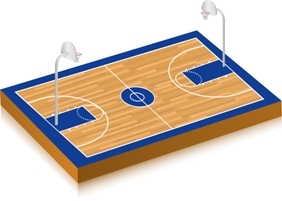 Coach will shoot from anywhere in the half court, hoping to create a [tag]rebound[/tag]. Defensive players yell “Shot” on release and boxout their opponent. To keep it competitive, award 1 point for [tag]defensive[/tag] rebounds and 2 points for [tag]offensive[/tag] rebounds, and switch after a set number of shots. Add up total points and losing team can run sprints or whatever. I definitely find that keeping track of points is the only way this drill works, and the players like the competitive nature of the drill. It’s simple but it does work.